Hardwood & softwood fire logs which are air dried. Designing & Sculpting natural wood based sculptures. Contact Dublin County Choppers today to discuss any job you might have. DCC have friendly, professional and certified arborists / tree surgeons available to work 7 days a week. We provide a unique service whereby we can design and sculpt natural wood based sculptures. We offer FREE delivery in South Dublin & North Wicklow. 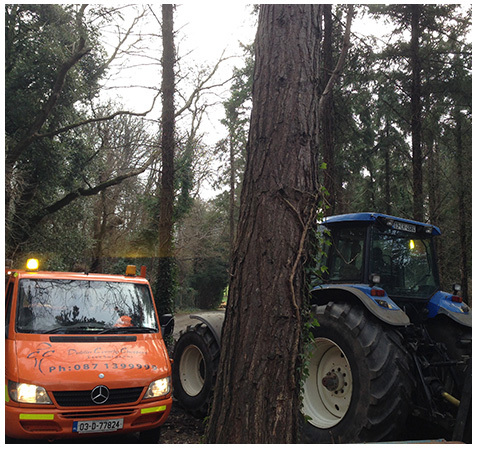 Dublin County Choppers are a passionate and professional Tree Services Company, based in Dublin 18. Our tree surgeons / arborists have over a decade of experience in Tree Surgery and associated tree services. We are certified and accredited by NPTC (City & Guilds), Lantra and Coillte. We are ready to offer high quality affordable, professional and comprehensive tree services to both residential and commercial customers. We have built a strong reputation due to the professionalism and expertise of our staff. Whether your project is residential or commercial, no project is too big or too small for our team to take on.